The Arizona Cardinals are right in the thick of the NFC playoff race, mostly on the back of their stellar defense. An aggressive unit that is ranked the seventh best in the league by NFL yardage standards, the Cardinals defense is littered with talented players and has kept them in a number of games. However, one disturbing flaw continues to rear its ugly head on that side of the ball. The Cardinals are hopeless at defending tight ends. From Jared Cook in week one all the way to Brent Celek and Zach Ertz in week thirteen, tight ends have tortured the Cardinals all season. How is such a talented group continuously failing at one specific task? Looking on the surface, there is not a clear answer. The players on defense traditionally assigned to covering tight ends, linebackers and safeties, from the Cardinals are all pretty well regarded, and some are even seemingly playing at Pro Bowl levels. Even Pro Football Focus’ metrics have those players on the Cardinals all grading out on the positive end in coverage. Of course, NFL defensive coordinators do not exculsively use these players to defend tight ends, but with most tight ends attacking the middle of the field and down the seams, more often than not these are the defenders they come in contact with. So if all these players are statistically grading out well in coverage, why are tight ends doing so much damage against the Cardinals? The old reliable eye in the sky reveals that the devil is in the details. Here are three issues that have been consistent culprits on the big plays Arizona has given up to opposing tight ends. 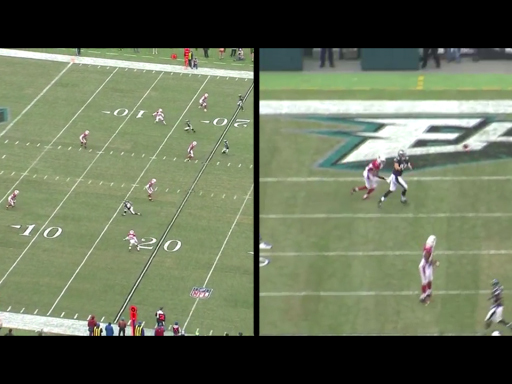 With Mathieu’s step towards the play fake, there is already too much separation between he and Ertz to recover. Nick Foles is able to deliver a pass right to his tight end almost as soon as he is turned around. The player known as “The Honey Badger” has made some big plays with his aggressive nature and nose for the ball, but every once and awhile he gets taken advantage of, as he did in this instance. Defensive coordinator Todd Bowles has to come to an agreeable balance with how aggressive his defense plays, especially his safeties. That style can absolutely bring about turnovers and sacks for his team, but the tape shows it is also getting them killed against tight ends. 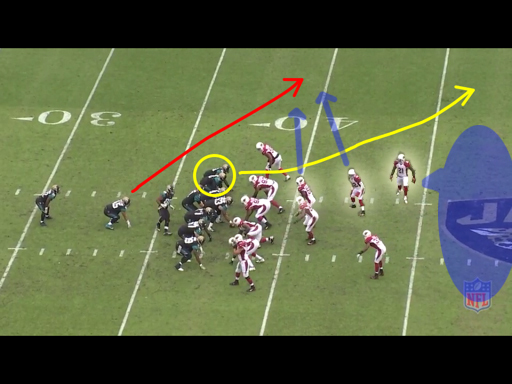 On this play the highlighted defenders (Daryl Washington, Tyrann Mathieu, and Patrick Peterson-left to right) are the primary culprits in allowing Jaguars tight end Danny Noble (yellow circle) to get free for a 62-yard touchdown. Before the snap, Daryl Washington and many other defenders can be seen waving their hands at each other and pointing for others to adjust. The defense seems very confused by whatever the Jaguars plan on doing out of this 23 personnel look. Someone out of this trio lost their assignment in all the miscommunication pre-snap. It seems highly unlikely Mathieu and Washington both were assigned to defend the fullback. Peterson seems to be the guard of the middle of the field, but he has absolutely no concern with what is going on laterally on this play. With no one occupying the intermediate left side of the field, Noble is left uncovered by the defense. 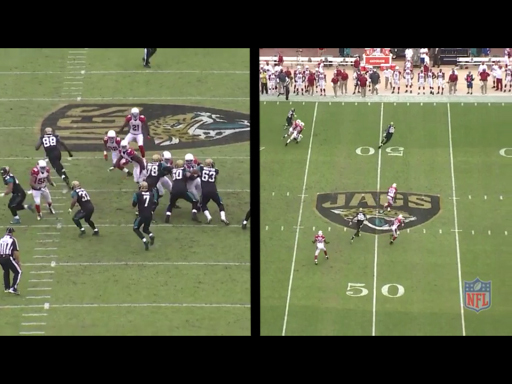 The image on the right shows Noble is open an egregious amount by NFL standards. The second year tight end is able to catch this pass and run all the way to the end zone for a score. For the trivia buffs out there, this is Danny Noble’s one and only career catch. While this accounts for a pretty small percentage of plays the Cardinals have given up to tight ends, every once and awhile pre-snap miscommunication has caused some big holes in their defense. If the defense can tighten up some of those loose screws, maybe those holes will shrink. On their aggressive blitz plays, the Cardinals have a knack for feeding off of each other. However, sometimes when watching the defense drop back in passive coverage, it feels like these are eleven players with a different agenda. 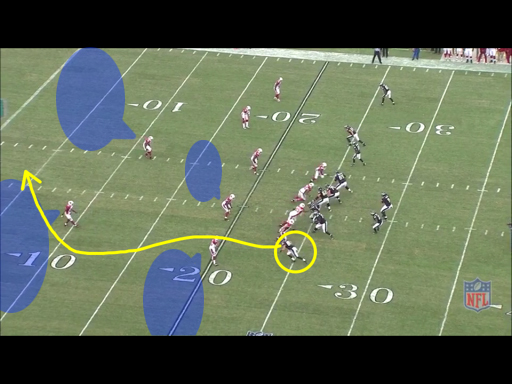 Dansby (the highlighted defender) opens his hips to Ertz in case he needs to follow him down the field. However, the veteran linebacker reads that Nick Foles’ eyes are focused on the right side of the field. Dansby elects to pass Ertz off to the two defensive backs to his right, and stay in the middle of the field to defend a possible cross from one of the wide receivers. 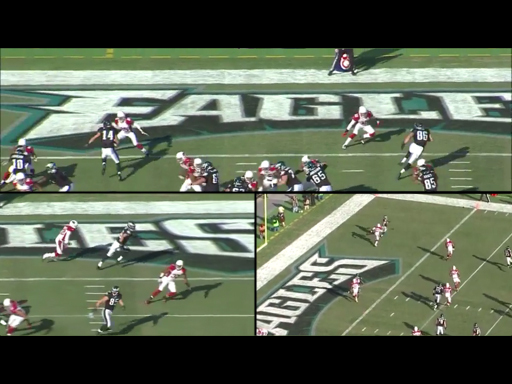 The right cornerback fails to take responsibility for Ertz, and passes him off to the deep safety. The problem is the safety does not close on the tight end and instead continues to drop. 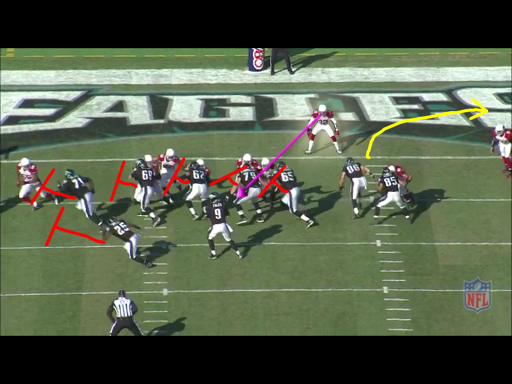 There is too much depth in his coverage to get to Ertz in enough time to make a stop. Nick Foles is able to flip around and toss the ball down the middle of the field for a touchdown. The defenses’ failure to act as a singularly minded unit allowed for a gaping hole to again be present in the middle of the field for a tight end. The Cardinals have to act as a more cohesive unit in zone coverage or tight ends will continue to find these areas of the field open. If only they fed off each other in passive situations like they do in aggressive ones. Upon looking through the eye in the sky, it can be concluded it is not personnel issues that are preventing the Cardinals from effectively defending tight ends. Instead, it seems that a number of minor mistakes and undisciplined tendencies that have crept into this defense has caused them to falter pretty significantly in one area. Luckily for this potential playoff team, these mistakes can be corrected. Todd Bowles and his players must dial down the aggressiveness ever so slightly, prevent miscommunications, and foster the growth of this unit into a more cohesive one in all situations. That may sound like a tall task, but Bowles has proven to be a pretty strong and adaptable defensive coach this season. He also has plenty of talented athletes at his disposable to make this a successful mission. If the Arizona Cardinals can turn those areas around they could see a great defense take the next step, and tight ends may not be such a thorn in their side.